It is surprising to me that apples in this day and age still have cores. I mean, watermelons and grapes are now seedless. Apples are wondering when their day is coming. Okay, I'm wondering that. I'd also advocate for pit-free cherries. I thought it would be all meditative and soothing to be coring apples (and I only did 4!). Looking back, I have no idea why I thought that would be the case. At all. For one thing, I am completely incapable of having those kinds of attributes. Instead, I lean towards "anxious" and "stressed." I feel like that is something I need to work on, but that just makes me more anxious. So it is what it is. And yes, I've tried the whole yoga thing. Secondly, maybe the 90 degree weather also played a part in making things not so fun. Okay, probably a large part of it. In addition to being the anxious type, I am also stubborn and delusional - stubborn in that, since September 1, I have declared it to be Autumn here... and delusional since "here" is Southern California. It has been like 90 here the past few days. And it is October. I'm confused by this. But because it is Autumn, I must do Autumn things. Even if the weather doesn't cooperate. And perhaps I should consider one of those apple corer gadgets. But despite the annoyance of taking out the cores and the overbearing heat, I loved every bite of these. Completely and utterly worth the hassle. Heat oven to 350. In a medium bowl, mix together the brown sugar, juniper berries, melted butter, salt, pine nuts, all spice, orange juice, and orange zest. Fill the apples with brown sugar mixture. In a small bowl, mix brandy and water, and any remaining brown sugar mixture. Place the stuffed apples in ovenproof dish, then pour the brandy mixture on the bottom. Bake for about 45 minutes or until the apples are tender but hold their shape. Serve with vanilla whipped cream. I'm so excited to see you used juniper berries...they are so mysterious to me, and I've never seen anyone use them before. Have you seen Eat, Pray, Love? You would love the scene where she tries to meditate and looks up to see only a minute has gone by...haha. There's an ingredient you don't see everyday--Juniper Berries! How lovely. I'm right there with you on the anxiety issue(s). It's quite the wicked snowball, stress. I love that you have added juniper berries in the filling. These baked apples must be delectable! What a tasty looking baked apple dessert. Yum! Pitless cheeries and coreless apples need to happen. But the apple needs to be hollow in the middle, so that I can make these without expending any effort. I'm gonna go check on the apples I just picked to see if any are hollow. I'm the anxious type too, so I know how you feel. I thought pitting cherries would be relaxing; instead, they were tedious and messy. Not at all relaxing, and my fingers were dyed red for several days after. I, too, need to invest in a cherry pitter and an apple corer. Makes life so much easier. These baked apples look amazing. I love the addition of the juniper. Yum! Mmm, baked apples! These sound fantastic! These look fabulous. I loved baked apples and so intrigued by the juniper. I'll trade you weather. I'm in Southern Ontario and it's freaking freezing and pouring rain right now. I'll have to turn the heat on tonight. I may cry. Seriously. I need to move. And if you can find a way to make pitless cherries I pledge my undying love and loyalty to you forever. Like "swimfan" kind of love. No joke! Baked apples remind me of fall in the very best way. I happen to gnaw on apple cores (and often accidentally eat the seeds). I love how you added pine nuts to this too. My favorite! Thank you for sharing! What a lovely combination of flavors! We actually have an apple corer so it's not so bad...it's basically a tiny spoon that you use to scoop out the apple insides. It's a lifesaver. 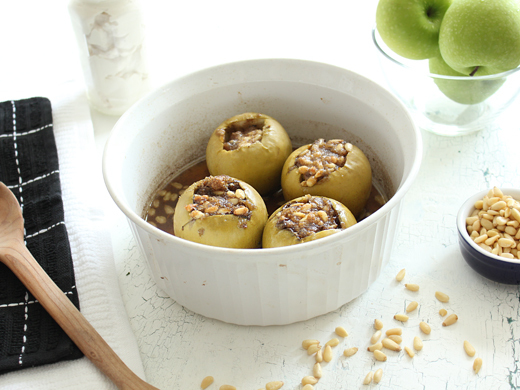 LOVE the flavors inside these baked apples! Worth the effort for sure. I know just how you feel. It's Spring here and I still feel compelled to do Autumn cooking. I spent most of my life in the states and all my family is still there so I think northern hemisphere. It's going to be 86F today and I'll be making pumpkin bread. I agree! All fruits should become pit free. I love both apples and pine nuts, they sound heavenly together! This is a new way of cooking apple for me and I've never had a chance to taste something like this. Looks fun and delicious! Totally fall inspired recipe that I would love to give it a try! Divine! Those baked apples must be wonderfully spicy. I love the addition of juniper berries.